It’s mosquito season and my kids (and I!) have already been attacked in the middle of the night. So annoying! So I’ve started the war and have been putting little cups with citronella oil in the bedrooms. 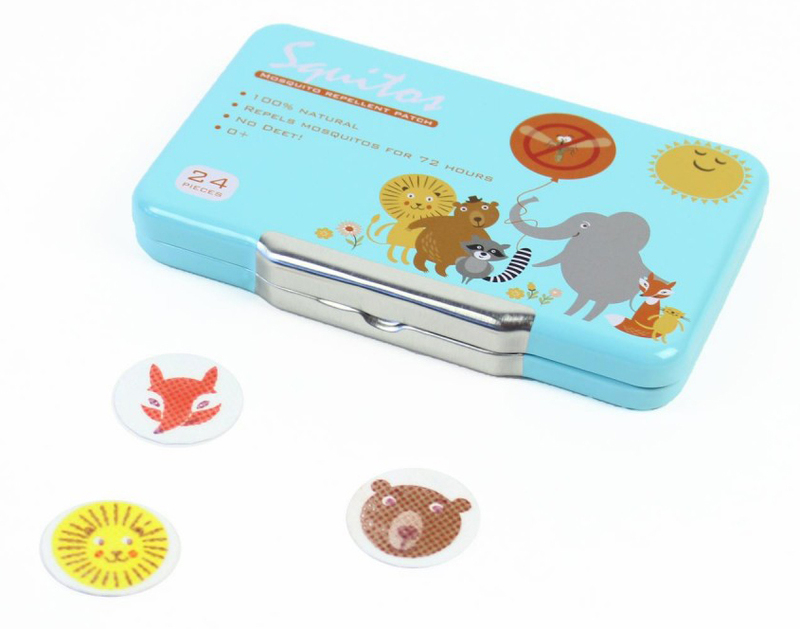 I have also been trying Squitos mosquito repellent patches and I really like them! With just citronella oils and eucalytus oil (no deet! ), these patches are 100% natural and super easy to use. Just stick them anywhere close to your child’s body (bed, table, clothes) and they will keep mosquitos away for at least 72 hours. There are 6 cute stickers in each pack (4 packs per tin) — my kids love to collect all of them above their beds. They come off easily as well. I’ve been starting to use them for myself too and they really work! Even though I still like the thought of essential oils as a natural mosquito repellent, these stickers are a handy alternative. They are perfect for traveling too! Any ideas on where to buy in the US?